I have a question or would like to engage in discussion about Bows. We might have discussed this in the past or in pieces here and there over the years, but usually if I am not looking or in the market, I don't always pay close attention details. I don't know exactly how to say what I want to discuss, but I would like to discuss or talk about bows. What makes a bow good? If I have been playing on bows that are in the 50 -100 range, will I notice a difference in a new bow that is say just a bit more? Specifically a wood, Pernambuco bow? What does one look for when buying a bow? I currently use a 49 dollar wood bow that I bought on some dutch auction for little $. I never used it too much but I recently gave myself a month with it. MEH?? nothing special in my mind. The other bow my FM carbon Fiber bow is better than the cheap wood bow. And I have a composite carbon fiber bow also. I think it is a pretty good bow .. like the FM bow. (maybe less hair) Both the carbon bows are the same weight. Just to give you an idea of what I am playing. Okay, since I post videos here and to my friends privately.. it is no secret that I have a bowing issue... first bowing on the edge became a bad habit and then the wandering bow, and now new to me a bow bounce. I know that a new bow will not solve my technical / form issues. I guess I want to bow shop for the next 3-6 months and I'd like to hear what you all have to say about that. I'll chime in. For me, the bow makes a HUGE difference. Those $49 bows,they feel like clubs in my hand...horrible. I use the fiddlerman CF violin bow on my Viola because the bow that came with it isnt the greatest (bounces a lot ) Balance and agility is what you look for and that improves (or should) as the price goes up. My Presto Encore violin bow is better (and more then twice the price) then my FM bow, but not quite up to the task on the Viola...though it excells on the violin. Sure it helps Barry. From what I can tell the wood bow that I have is okay, but I do believe it is "clunky" .. Bulky? I am not sure. One of my CF bows is more delicate and agile. But just to know that you are saying that a better bow makes a huge difference, well I like that Idea. Next time I get with my violin gal pal, I should ask to try her nice bow. I have tried it in the past but that was a year or so ago.. when a bow didn't make any difference. I swear even if getting a new more expensive bow is a motivation to bow better then it is a good idea right? I have been very satisfied with my FM CF bow. I had a wood bow before it and it just made learning much harder > bow balance without too much weight made a big difference for me. The FM CF lets me apply the pressure when pressure is needed more easily. Choosing a bow for any instrument is a very personal thing, it has to have a comfortable weight, good balance, produce a good sound and also have enough strength in the camber to match your playing style, some people have a heavy bow hand and will need a bow with a strong camber to produce a good sound and hold the pressure applied to it. When choosing a bow look at the wood grain it should be straight and running down the stick to the tip, if the grain is curved or slants down at the tip it can be week and prone to breakage at the tip. when the bow is tightened look down the bow from the screw end, the bow should be straight and have no curve, turn the bow on it’s side and look down it the same way, it should still have some camber (a slight curve), when you hold the tip and apply some pressure as if your playing it should still have a strength to the bow. Check the stick for any knots or cracks, knots can make the bow warp in future and can also make the bow weak. When you visit a store to buy a bow don’t be afraid to try 5 or more bow’s get a feel for each bow and try and feel and hear the difference when you play it on your violin, test different playing styles and techniques try different scales play each bow for 5 or 10 min’s to get the feel, don’t just play a simple scale, play scales and songs, soft and loud every bow is different, so try different bows in same price range, if you cant tell a difference ask the store manager to help you decide or even take it to you teacher t help you decide. Bow will have different kinds of Tip plate’s materials, different winding, and leather used for thumb grip a swell as different types of frogs ill explain below. I do get a bit intimidated and I do shy away from sales pressure. I suppose if they are rude and don't like me testing.. I can simply leave. Hello there Stonedog!!! Thank you for your thoughts. I too like my FM CF bow. Maybe I should just stick with a good thing for now. A better bow than the Fiddlerman Carbon Fiber bow will be slightly better and you may not notice. However, I say that because I love the FM Carbon Fiber bow. I had it made to my specifications. They weight and balance is what I requested and they did a great job. I'm able to keep the price down because there are no middle men, distributors, advertising to speak of and we buy bulk. They are hand made so no two will be entirely 100% the same but fairly close. You may prefer the warm sound that a great wooden bow produces but it's not easy to find a great wood bow for little money, as you mentioned above (a bit more)... For a wooden bow you would need to look in at least the $500 range IMAO. The things to consider are. Weight, balance, strength, arch, feel and sound. Try different tensions on your FM CF bow to see if you can better the bouncing situation. It's a tough bow and doesn't require much pressure. I would test a quarter inch or less to see if that helps. @Fiddlerman Hey Pierre. Thank you for that information. It is good to know that I have what I need for now. Saves me $ and forces me to work on bowing. For what it's worth, I have 5 bows. 1- A very, very, old pernambuco (maybe the real deal, maybe not) that was with the old German violin I have that dates to the late 1880-90's. 2- A very old pernambuco or other very hard dark wood that came with the "Christmas Violin" my daughter found at an estate sale that dates into the early 1900's, and has the name "Roberts" inside it in old ink handwriting. 3- A cheap Chinese bow that came with my cheaper violin (which I turned into and acoustic/electric) I bought some 12-15 years ago. (wood? who knows, maybe an old piece of 2 x 4 they found at a construction site in China)! 4- Another cheap wood (?) bow from China that I got for a kick around spare over 2 years ago and cost me an arm and a leg, well... not quite, but it was at least $10.00 including shipping! I like the CF bow on the electric violin I made from my cheap Chinese violin of 12-15 yrs of age. Sounds cleaner on the electric portion. Doesn't take hardly any pressure, almost plays by itself. No 2 in line for ease of play is bow #1 (the oldest of the crew) and it sounds fabulous on both old acoustic violins. 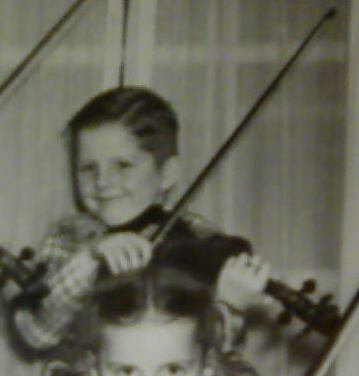 Not much difference in it and the CF bow when I play on the newest violin I have which was a gift as a "kit" from Toni at Christmas. The violin is only a year old so it may favor one of the other bows as it ages. No 3 in line to be played is believe it or not, bow #3. Heavy at 62-63 grams but I re-haired it a year ago and it sounds great on the new violin. Who knows, maybe it just likes the heavier harshness of the hair against the strings. Before I got the second CF bow I was in love with the FM carbon fiber bow. It was difficult to let it go but I felt Toni could use it more than I with her new more professional violin. All in all, I have separate preferences for each violin I play with. There seems to not be any one set bow I prefer but if I only consider one violin, then it has a particular bow that sounds best... sometimes I guess, it's just trial and error until you find the right one, and it might take some time too, and your requirements will change as you become a better and better violinist I think. I never said anything about this because it's not my place to reveal this information and I didn't know how much you wanted others to know but it really touched me that you did that for Toni. I'm glad others can see your post too. You have a giant heart!!! So does Toni so I was super happy to hear it. @Fiddlerman ... I will never forget getting my soloist as a gift. I love that violin, it has been so well played in the last 8 months, She's a dream for me. My bond with my violin sometimes is probably a bit on the obsessive side. 🙂 Denny heart is giant and golden. I will work the with FM CF bow. In reality... bowing exercises are a reality that must happen for me, or I don't think I will progress as I want. @cdennyb what a great lil' article on your bows. Nice that you know your bows well enough to break it down and your violins too. I have always admired that you play all your violins and know them so well. ( you know I struggle with having four violins, I only play one and the others sit so I am thinking of getting rid of them???). When I hear how you play all yours and I know you are so good to all of them, I feel neglectful. After a stint with an inexpensive wood bow for 6 weeks and a return last week to the FM Carbon Fiber Bow, last week, I think I will stick with that bow for a bit. I switched back to the FM CF bow the day before I made the Drunken Sailor video. Thanks again for the bow talk everyone. @ Pierre.... Thank you so much for the kind words... it's who I am, it's what I do. I think giving something to someone is a very personal thing and I didn't want people to think I was looking for approval or attention or even acknowledgment but it's been several months now and I don't think it matters that much anymore that people who read this will know. I'm so glad that Toni likes her violin and has accepted it so well... many times when you give something to someone, they seem to feel obligated to "like it" and say they like it just because it was a gift, and I didn't want that kind of pressure on her if it didn't work out. Apparently it HAS worked out and quite well too I might add! I'm not a wealthy guy at all but I'm certainly "richer" and to see the progression that she has made makes me smile inside. Throughout my life, many people have helped me, some in obviously 'public' ways and some very secretive. I'm just trying to "pay it forward" and sometimes life presents these opportunities and I take advantage since I feel they were given to me to act upon and I'm obligated to help anyone who needs it. You can understand that, as you are the same way my friend. If these words I've written inspire anyone else to "help" when the need shows itself to them, then I feel my time here at the keyboard was well spent. I have been inspired and moved beyond words for the gifts. Denny was also the first member on the Fiddlerman forum to reach out to help me with a tune waaaaay back when. We both were learning Over the Rainbow. He played the tune and posted it. He was kind enough to pm me a video that he had used to play along to learn the song. Then .. we moved on to Sad Romance. I was sure that it was way to hard and he was sure that we could learn it. He paved the way with videos and help so that I could learn that song. Everyone here at the forum has helped me in so many ways. (made videos for me, loaned me guitars, sent me sheet music and back tracks, helped me with theory homework, answered endless questions and PMs, chatted with me for hours when I have been lonely.) I feel inspired to help and give back also. ((((((((group hug))))))))) I love you guys!!! @coolpinkone : I was going to add my 2¢ to the subject, but since you have decided to stay with your FM / CF bow (good idea at this point) I'll not say a word about bows. I just want you all to know how awesome you all are and everyone on the forum. What a wonderful group of people we have here at Fiddlerman.com. I guess that's what humanity is all about, 'helping one another'. Well.. Ken... I will be bow shopping in 6-10 months.. So I'd love any insight you have.